Die ersten 5 Monate nur über Ballingsalze, danach bei steigendem Besatz über Kalkreaktor. Aufgrund von Platzmangel im Technikbecken seit Januar 2014 wieder Balling mittels Dosierpumpe. What are the intensities per channel and durations on your eco tech LEDs. Where can I find our information in the NYOS additives you are using? At the moment, I got 100% for around 7 hours for both Radions, I will post my graphs later here. I’m going to add another Radion Pro the next days. Not because of light intensity but for a better light uniformity. For more information about the NYOS products, check their website http://www.nyos.info. I can recommend them – they do a perfect job! Benutzt du einen Phosphatabsorber? Wenn ja welchen? und wieviel + Wechselintervall? ja ich nutze PHOSI-EX, ca. 250ml alle 2-3 Wochen gewechselt. Nimm dann einfach nicht so viel Zeolith und Adsorber … über die Menge kann man das eigentlich ganz gut steuern. Wie bekommst du PO4 ins Aq? ich habe einen relativ hohen PO4 Wert, da ich mit dem Fro-Fu spülen etwas nachlässig war. Zudem füttere ich 4 Würfel Mysis und Artemia am Tag. Mit PO4-Adsorber halte ich ihn nun konstant unten. Wie viel Lebendgestein wurde denn in diesem Becken verbaut? Vielen Dank! Etwa 30kg Lebendgestein habe ich verbaut. Also ich kann hier auch nur wie meine Vorgänger sagen was für ein perfektes Riffaquarium du hast ! Ich wollte mal fragen welche Produkte bzw. Mischung du für dein Kalkreaktor in Anspruch nimmst ? Ich habe im Kalkreaktor ganz normalen no name Korallenbruch. 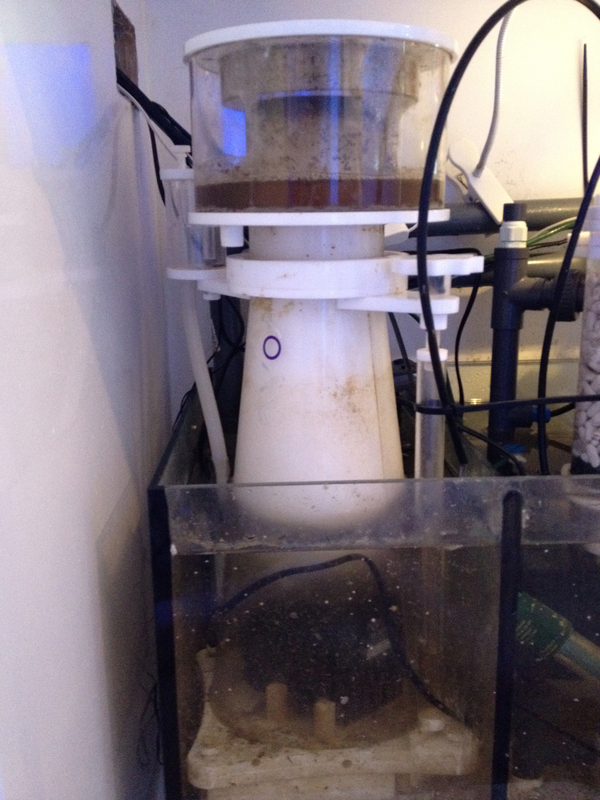 VERY NICE AQUARIUM, best of luck with, I had your same problem with cyano, installed a phostphate reactor and it went off the rocks but took over the sand, just installed a RODI water filter for my top off water and water changes, do you think that will solve the problem for hair algae, cyano algae, brown …. Hope that helps, keep me updated! what a wonderfull tank! But I’m wondering if you use Zeolit?? What Nyos water care and coral food advice me? yes – I’m using Zeolith since some months. After my tank crashed, NO3 raised up but now I’m back at 3 mg/l. – Goldpods and liquid foods are perfect LPS & fish food. Hi Sebastian, thanks for your answer! you could stop it at every moment. Only with the Zero, I would stop over some weeks reducing the dosage. As I search some information about differents products, is it possible to use Red Sea Protocol ABCD and those Nyos Products? I don’t use the Red Sea Elements and don’t know exactly about the ingredients. You could use all the NYOS products without the Nyos Active Elements, Nyos Strontium and Nyos Iod. This should already be included in the Red Sea product. All the other products like food, Zero, Aminos, Nectar etc… should be ok! hi Mr.can you show me or teach me how to setting light radion xr30wpro for growth sps ? i try go to blog to download your grapih of radion but can open.how much intensity and brightness do you set? The growth and colors are very good… I had some issues in spring 2013 (tankcrash) and after that, corals didn’t grow that fast for around 2 months and nutrient levels were too high. Now I’m back at the growth rate which I know from T5. hab mir grad mit feuchten Augen deinen MW Traum angeschaut und bin immer noch von deinen Bildern fasziniert. Mich würde deine Fischbesatz interessieren, da ich als MW Noob nicht jeden identifizieren kann. Betreibt Nyos bei dir aktives Sponsoring oder bist du von der Marke so überzeugt? Als Neuling hat man es ja sehr schwer sich zu orientieren bei der vielfalt?! Hoffe ich habe keine vergessen. eine Frage habe ich erstmal wieso der Umstieg auf Led? habe seit einer woche zwei g3 über meinem becken.habe da mal ne frage zu. habe ein vorgefertigtes programm laufen und gerade beobachtet das mein mondlicht bei einer plötzlich schwächer ist als bei der anderen, war gestern noch nicht so, bekomme auch die schedules nicht geladen die ihr bereitstellt. bezüglich dem Mondlicht kann ich dir nicht weiterhelfen. Vielleicht hast du Lunar Phases (Mondphasen) an und es kommt daher? Oder den Modus, dass die Lampen zeitgesteuert mit einer Verzögerung agieren (Sonnenaufgang/Untergang?). Es kann auch sein dass es in dem vorgefertigten Modus so voreingestellt ist. Die Schedules müssest du eigentlich locker importieren können. Klicke hier (http://ilovereefing.de/radion-graphs/) auf „Download Schedule“, entpacke das *.zip und lade die *.xml wenn du bei ecosmartlive.com eingeloggt bist klickst du auf „Schedule Options“ und „Import Schedule“. Sichere aber deinen bisherigen vorher mit der Option „Export Schedule“, dann kannst du ihn wiederherstellen, wenn dir unsere Settings nicht gefallen. Can you provide a list of the corals you have in the tank now? I just started my 210 gallon tank and yours is an inspiration! I give my best to make a list as soon as possible. In general I can say, that I have 50% SPS (mostly Bali and some Aussie), and 50% LPS like Euphyllia and around 15 Acanthastrea frags. I also like Lobophyllia and Favia. Hi Sebastian, first and foremost a card by that beautiful and thank the expertise you share tank. I don’t know the APEX controller but I think the setting should work on your new tank. Would love to see your new setup! Are you still using the same radion graph as on here and what % are you at. yes I’m using the same graph and have 60% max. during the day. als erstes ein ganz großes Lob fr dein Becken. Dieses ist echt ein Traum. Kurz eine Frage. fährst du das Becken ganztägig so optisch blaulastig oder änderst du das Farbspektrum nur für Fotos? Finde es optisch sehr schick, kann mir nur nicht vorstellen das sämtliche Lebewesen dabei problemlos klar kommen. PS bist du noch an der Planung für ein größeres Becken dabei? danke für’s Lob. Das Becken wird im Tagesverlauf zwar überwiegend blau, aber nachmittags ca. 3-4 Stunden ziemlich hell mit hohem weissanteil beleuchtet. Wenn ich mal Zeit habe mache ich ein Video über den Tagesverlauf, dann wird das sichtbarer. first of all, actually, best compliments for your aquarium: I’m now designing my first reef tank and I’m going to take inspiration by your! You wrote that your rocks are 100% alive? How many kilos did you used? 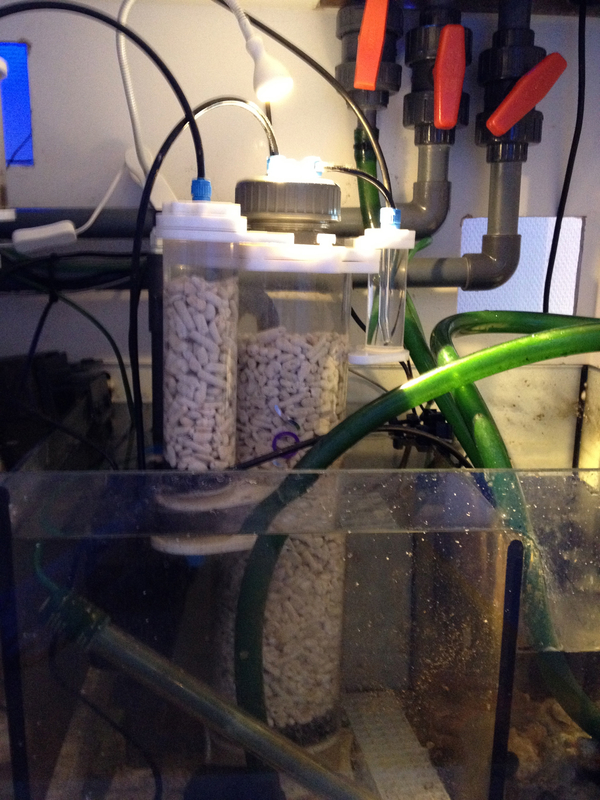 Just found your blog and can’t help admire your fantastic aquarium. You mention that you are using Zeolith. How exactly are you applying the use of Zeolith to the Nyos water treatment method? I see you have not mentioned the use of the Nyos Bac, so how are you populating the bacteria colonies within the Zeolith, or does the Nyos Zero do that job? Sorry we are not familiar with the Nyos system here in South Africa. Is this the Red Sea reefer? 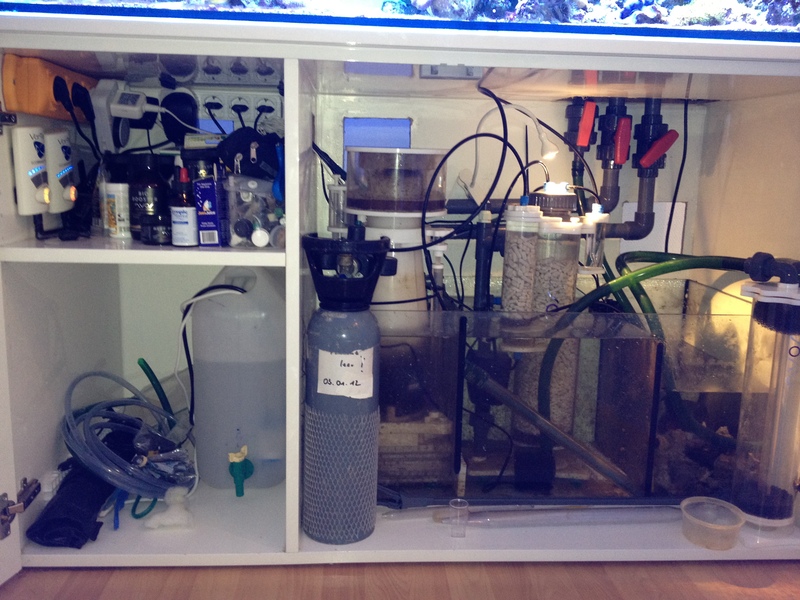 Is the tank, cabinet and sump custom made? in fact it looks a bit like the new Red Sea Reefer tank but it is a custom tank which i built some years ago. Your tanks is showing amazing coral growth at a very fast rate. Is the secret to your coral growth – NYOS addictive? If so, Could you list the most important few types you will recommend for SPS growth? I have to mention that the growth under T5 lightening was a bit faster – but it’s ok for me because I know have much more brighter colors. Your tank is stunning. Would you be able to provide me with the Radion schedule in different format than what has been posted? I cannot open this file to read the graph and time settings. You need to unzip the file, then you will have the *.xml file. Then log in to ecosmartlive.com, chose Export first (to export your settings once and save them). Then chose „import“, chose the xml file and you will see the graphs. Wann gibt es mal ein aktuelles Video? 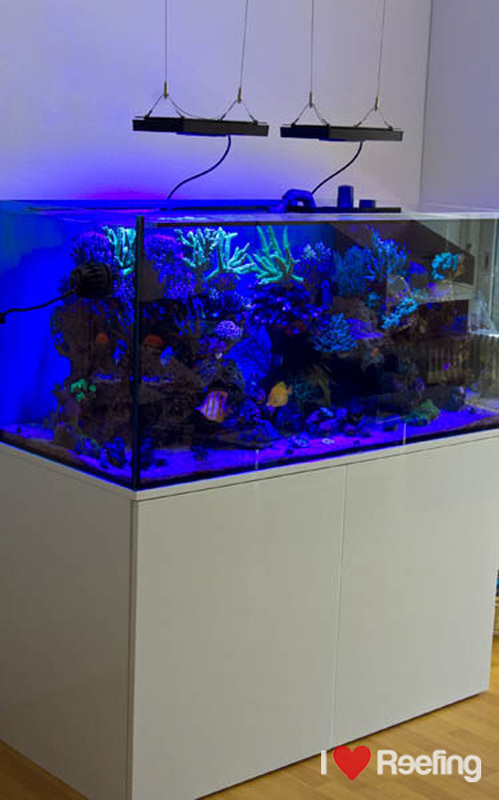 I have a 60″LX24W“X27″H reef tank with 3 Radion 3G Pro and 2 Kessil 360W. The schedule is for 12hrs 40% intensity with the natural graph. Do you have any recommendation for my setup? I keep 100 SPS and I’m using the zeovit program. I would appreciate any advise that you might have. First off great tank! I also have a heavy sps, lps 4x2x2 with 2 Radions G2’s and 2 Vortech qd‘ driven by reef link. Currently i have moved all my fish into a quarantine tank due to a white spot outbreak but another 6 weeks and they will be back in the reef. I use fauna marin balling light currently and i’m having ok results but growth is slow. Please could i ask what settings you use for your vortech pumps? Also i am having difficulty downloading your lighting program, when i try to import it to ecosmart it says (.evg files only)? For the Radion Schedule, you have to unzip the *.zip file and then import via ecosmartlive. Beautiful tank you got there mate. I noticed that you add 5ml Nyos zero a day, that’s way high than the recommended dose. is it safe to use that in larger quantities, I have a 150 gallon and started a dosing half the recommended dose (.55ml) and thinking to ramp up to 1.13 ml over the next few weeks. I also run a Bio Pellet reactor in conjunction with this. Any advise would be appreciated. yes, it is safe! You can ramp it up slowly until the Nitrate drops down. Don’t forget adding Bacs regularly. Zero is a carbon source, so it should boost your bacterias for lower Nitrate levels. nen ganz tolles Aquarium hast Du da! Ich habe mein Becken vor kurzer Zeit von T5 auf Radion umgestellt. Nun habe ich mir mal Deine Settings heruntergeladen. Die Farben wirken damit wirklich sehr schön. Ich wollte nur fragen ob Du damit gutes Wachstum der SPS hast? Es wirkt doch gerade morgens und abends sehr blau. Ich finde das persönlich sehr schön habe aber von den T5 doch mehr weißes Licht gehabt. ich habe mittlerweile die Beleuchtungszeit verkürzt und die Blauphase morgens rausgeschmissen. Meine SPS zeigen tolle Farben, das Wachstum ist OK. I LOVE your tank and the progress you have made. I was wondering if you have a schedule for your lights for running on apex? Also what programme you running on you MP40’s. Hi, I adopted your Radion’s Schedule with minor modifications and my corals look more brilliant!!! can you share also your vortech’s program? I have 2 MP40’s and my tank dimensions are 65″ long 28″ height & 20″ wide. Thank you very much… your tank was my inspiration for mine!!!! Würde zugerne auch einen juvenilen Pfauenkaiser setzen habe auch 500Liter. Wie groß war denn dein Pfauenkaiser wo du ihn gesetzt hast? Würdest du Gelbkehlen (Madagaskar) empfehlen oder ist das eigentlich egal deiner Meinung? Hattest du bisher Probleme mit Schädigung von SPS oder LPS Korallen? Welches Futter bietest du Ihm, und was nimmt er am liebsten? Gab es Probleme mit dem Flammenkaiser? Würde mich über deine Antworten freuen. Also what programme you running on you MP40′s. wunderschönes Becken hast du da. Welche Ballingsalze benutzt du? ein kleines Beckenupdate währe nicht schlecht. Welche mittel sind nach deinen Erfahrungen wirklich brauchbar und nötig? hast du sofern du noch aktiv bist deine aktuelle schedule da, die du hochladen könntest. Du meintest ja du hast die Beleuchtungszeit verkürzt und die morgendliche Blauphase rausgeschmissen. where did you get your long green staghorn acropora in the upper middle section?